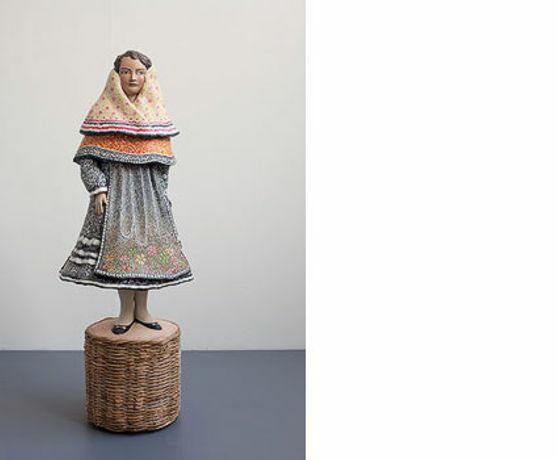 Denise de Cordova's third solo exhibition with the Eagle Gallery weaves strands of folklore, ethnography and regionalism to present strange tales of the female psyche. The show brings together recent sculpture, large-scale ceramics and a series of embroidered drawings. The stones of the artist's title refer to finds in the Asturias region of Spain and other parts of the world that are possibly natural, or could be the remains of stone-age tools or ancient gatherings - the 'elf bolts' of Wuthering Heights. They represent the reoccurrences across different cultures of shared customs and rites of passage, expressed in costuming, mask and ritualised object. Meaning and function are ambiguous and De Cordova's work plays with notions of surface embellishment being at odds with what lies beneath. Intricate details of ethnic dress are rendered in stitches, repeated in the painted surfaces of sculpture or in the traditional patterns of Chinese Blue ceramic glaze. Her women are represented in different ways and by different things: as decorative archetype, vessel, pot or basket. Weighted down and yet made powerful by their burdens, De Cordova describes the Doà ±a stones as the rocks that Eve might have thrown at God to express her rage at the punishment of having her sons set against each other.